Never before has a British monarch reached the grand age of 90. Struck to commemorate this historic occasion, this limited edition gold sovereign features two anniversary designs, specifically chosen to represent 1926 - the year of Her Majesty’s birth, and 2016 - the year of her 90th Birthday. 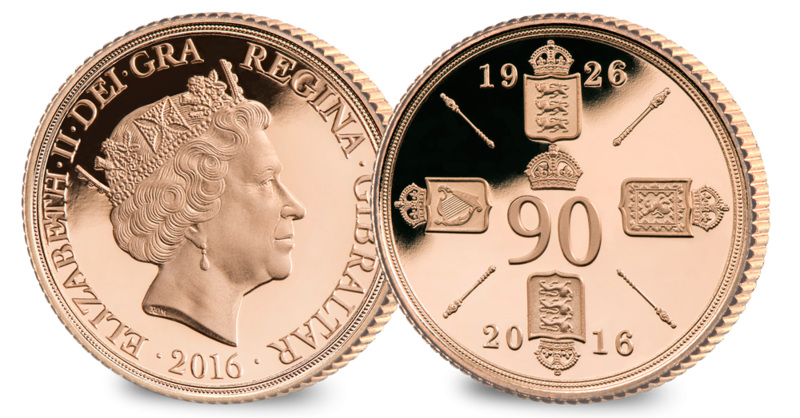 Minted specifically to mark Her Majesty’s 90th Birthday, the obverse of the coin features the new 90th birthday portrait of the Queen by British coin designer Raphael Maklouf. This is the first time ever that this portrait has featured on a gold sovereign. Raphael Maklouf ’s last effigy of H.M. The Queen featured on UK circulating coins between 1985 and 1997. The gold sovereign is one of the most famous and sought-after gold coins in the world. With the edition limit of only 2,016 worldwide, this 90th Birthday sovereign is certain to be no exception.